Resining is steadily becoming one of our more popular services. Resin is a high-gloss epoxy coating that creates a gorgeous, durable finish on any rigid piece. While the final effect can be stunning, resin is also notorious for being finicky and unpredictable. To prevent air bubbles and other unexpected reactions, we have a few tips below to help you prepare your art piece for the best resining experience possible. Whether you're bringing it or doing it on your own, these tips can still apply. 1 - Keep your material rigid. Whether you're painting on birchwood, doing a collage on aluminum, or sculpting on top of mdf, the principle is the same – whatever the medium is, make sure it is stiff, flat and rigid. As resin hardens, it becomes heavier, which can cause the fluid to shift unevenly throughout your piece. A common material that people want to resin is canvas. While possible, we typically recommend sliding in a wooden backing board behind the fabric to better support the resin. If you are buying pre-made or manufactured canvases, try to pick higher-quality ones that have thicker weights and that have been stretched as tightly as possible. This will prevent the resin from pooling in the middle of the canvas, causing it to sag. 2 - Fully seal your material before you create your artwork. We all know that the base material should be primed before you do you artwork – however, in this case, it is imperative that your surface is completely sealed before you begin your project. Otherwise, air may be able to filter through between cracks in birchwood or the gaps between canvas threads, resulting in more air-bubbles in the resin. Although air-bubbles can usually be mitigated by use of a blowtorch, some bubbles can still develop after the resin has been torched, hardening into long silvers of white cracks. 3 - Make sure your artwork is completely dry. One last thing to consider is to ensure your artpiece is completely dry and sealed with a top coat. Sometimes resin can lift certain mediums (think wet-based mediums like acrylic or ink in great concentration, or dry mediums that are powdery, such as pastels, chalk, etc), and they can migrate over to different part of the image. Sealing dry materials in with some fixative or matte top coat will help keep mediums in place while the resin runs and cures. And there you have it, some of our main 3 tips for successful resined pieces! If you would like us to resin a piece for you, visit us here. If we do not have a branch near you, or if you prefer to try it diy, we also sell ArtResin in our art supplies section. ArtResin is a new product that is much more safer, less toxic and more environmentally friendly than previous expoxy counterparts – a great medium to begin wetting your feet with. 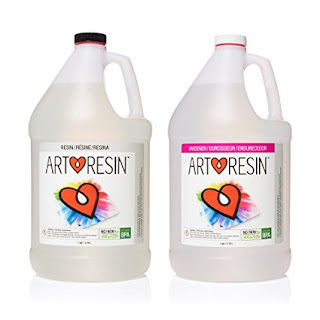 If you would like to try your hand at resining, we sell Art-Resin in kits starting at 32oz. You can purchase art resin from our Arts and Supplies section here. If you would rather we apply the resin for you, we also do offer resin-pouring services! Prices can be found on our calculator here, and it usually takes about 7 business days to complete. 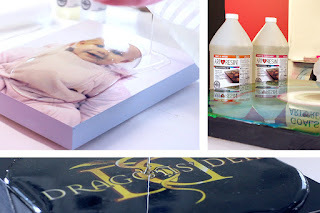 Resin can also be added to canvas print orders, or any order that has a rigid surface. KeenArt Media is an online fine art printing and framing company, specializing in canvas, archival and photographic prints and reproductions. We are proud to serve and support artists from all over Canada.